When Susan Tow (also know as “Susie Vila” by her friends for her passion for remodeling) began her yearly (and not very much fun) task of cleaning the grout in her master bathroom she didn’t realize the problems she was about to encounter. When she started scrubbing the grout joint – and then the tile – fell out to reveal a sopping wet backer board system. 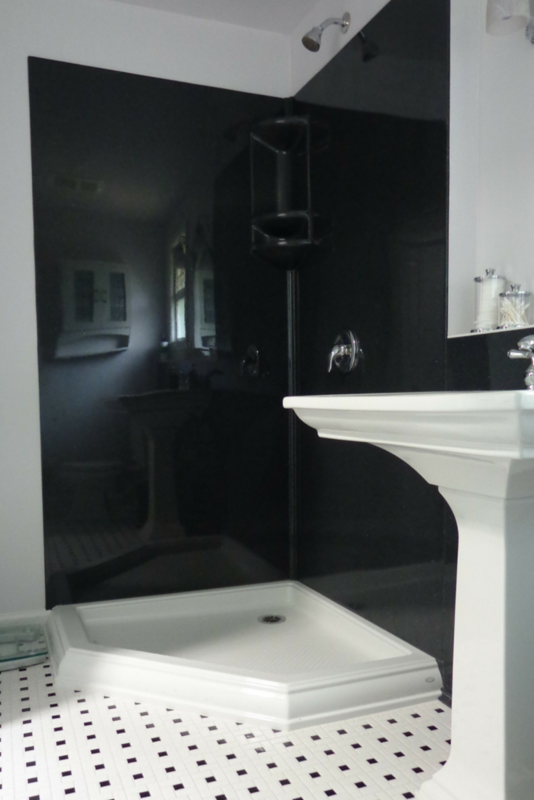 Then Susan noticed the tiled shower pan had also become waterlogged she came to the conclusion the time was right to upgrade and transform the bathroom into a low maintenance, high style black and white design she always dreamed of. In this article I’ll look at Susan’s three goals and the products and construction steps she took to turn her vision into reality. 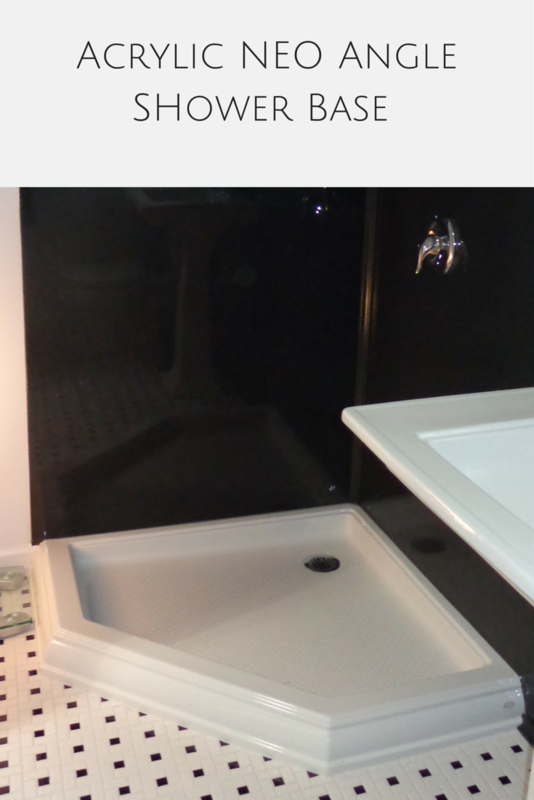 Selection 2 – White Acrylic NEO angle shower base – Susan used an acrylic over fiberglass NEO angle base from Kohler’s Memoire Collection which matches with her sink and toilet. Acrylic is an excellent fit to eliminate concerns of water leaking through the floor of the pan. Selection 3 – Black and White American Olean 12” x 12” x 1/8” mosaic tiles – The classic look is readily apparent in the Susan’s choice of the American Olean tiles. These thinner tiles were also helpful to provide enough room for the in floor heating system. Susan would not be called “Susie Vila” if she only cared about what you see in the bathroom – but also the construction behind the nice looking surfaces. Since she was completely redoing the shower the time was right to fix a couple of problems while the space was opened up. Inadequate insulation in the exterior shower walls – Once the old tile shower and wet backer board was removed it didn’t take a rocket scientist to see the lack of insulation in the walls (this also helped to explain why the bathroom heating ran more frequently than the heating in the bedroom). Susan decided to move the plumbing wall 4” towards the inside of the shower to allow enough room to fully insulate the exterior wall. 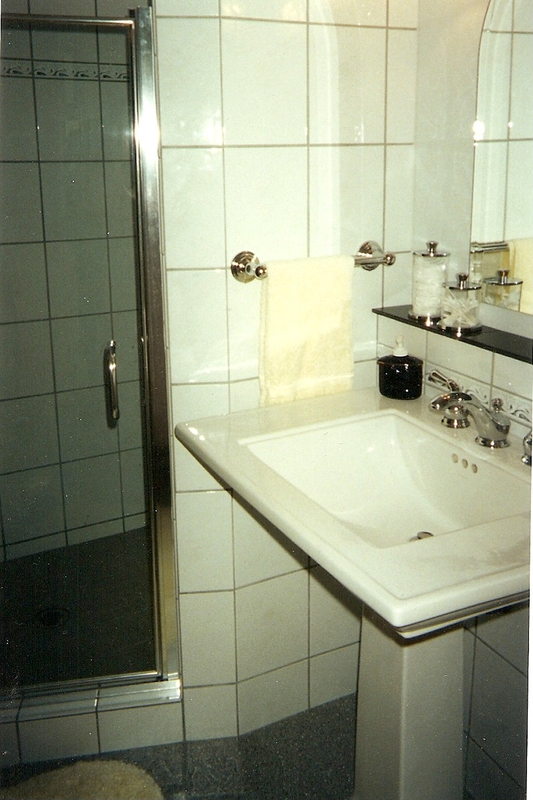 Problem 2 – A wet poured concrete shower pan – 15 years ago (when this tile shower was built) the most well known tile shower base construction method was used – a poured concrete base. Unfortunately water penetrated through the grout joints and the water was sitting underneath the surface of the shower floor (fortunately none of this water found a hole in the rubber membrane and went through to the ceiling below). To eliminate any concern about water leakage in the future a gel coat acrylic over fiberglass shower pan was used (note: If Susan had wanted to retile the shower there are now waterproof ready for tile shower pans). Product 1 – In floor heating – Who wouldn’t love stepping out of their shower onto a nice warm heated floor in the winter? The new heated floor fit nicely under the thinner 1/8” thick black and white American Olean tile selection. 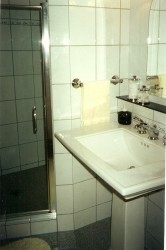 Product 2 – Frameless glass doors – The old framed and tiled shower walls created a small, cramped and closed-in feeling. Susan is looking forward to getting the final touch put onto her bathroom – a frameless glass shower enclosure. This system will provide an open feeling in this master bath and make it easier to shave in the shower as well. 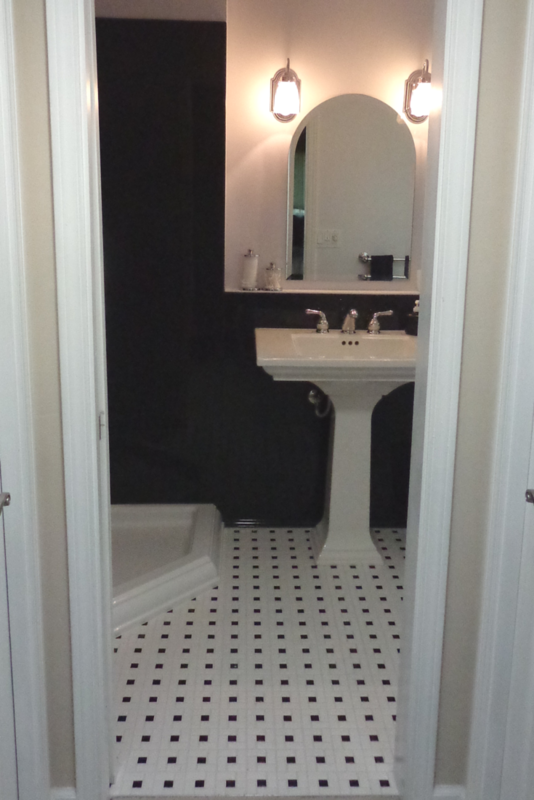 What’s you’re favorite feature of Susan’ new black and white bathroom? Please comment below or call us for help with products or inspirational bathroom ideas . If you’re looking for information or a free estimate on remodeling a shower or nationwide material supply for solid surface grout free shower wall panels and shower bases call The Bath Doctor in Cleveland (216-531-6085), Columbus (614-252-7294) or for nationwide supply Innovate Building Solutions (877-668-5888).